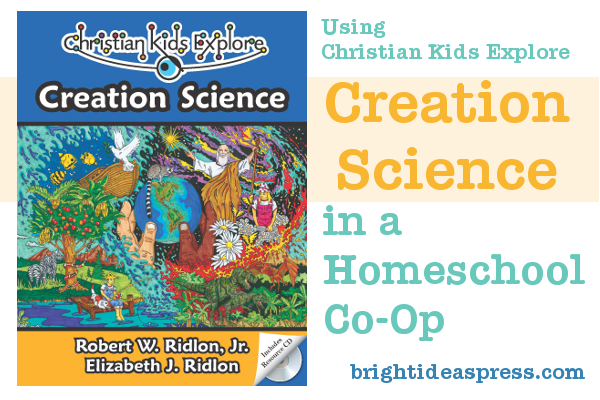 Welcome to the first post in a series about how I use Christian Kids Explore Creation Science in a homeschool co-op* of two moms and three boys grades 7, 4, and K. We meet once each week to do hands-on activities together: an observing activity, scrapbooks, 2 to 3 science activities, and puppets. Each week you will get a glimpse in how we adapt the curriculum or add in extras to fit the different learning styles of each student. Since observing is a key component to science, we have a weekly observation activity. We lay out a random group of objects. The boys study the objects and close their eyes while we take one item away. Then they have to tell us which item is missing. The seventh grader in the group records how many times each of them could name the missing items. At the end of the unit, he will graph the results. The older 2 boys are completing the notebook as described in lesson 1 of CKE Creation Science. If you are looking for a cover sheet, book log, or movie log to accompany the Creation Science notebook, see these freebies at Layered Soul. We thought a scrapbook style notebook would be a great way to review each week. At the beginning of a new session, we have the boys glue in photos from the last meeting and write a few captions as they discuss what they learned from the class before. Please note these are basic scrapbooks. We aren’t using colored paper, fancy scissors, or stickers. I have a photo app for my local drug store which helps me get the photos developed every week. Although we plan for three science activities each week, sometimes we only get to two of them. We stop when it is lunchtime because our boys lose focus when it’s time to eat. As a final wrap up, we use a box of puppets and props to narrate what we learned. We give the boys three words from the lesson which they have to incorporate them into an impromptu puppet show. We invite the teens from upstairs to be the audience as the co-op boys share what they are learning in class. *Learn more about using Bright Ideas Press curriculum in a co-op setting.